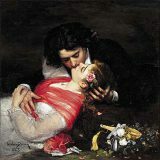 Any day that I can introduce my friend and fellow Bluestocking Belle Jude Knight to my First Kiss Friday blog is a really good day. Jude writes incredible stories that pull you in from page one and makes you want to start all over again when you’re done. Today Jude has an excerpt from The Lost Wife, one of her short stories in her upcoming release Lost In The Tale. We hope you enjoy this first kiss scene. Happy reading! A rattle drew their attention to the kitten. It had found the saddle bags, and was batting a loose strap so that it swung and knocked two buckles together. He didn’t have to let her go—just lean across and pull the bags towards him, the kitten scampering behind, enjoying the new game. It pounced on the flap he wanted, and he picked it up and handed it to Callie while he pulled out the oilskin wrapped package he wanted. She turned slightly so she could lean against him and use both hands to unwrap the package, and he kept one arm around her while with his other hand he turned the kitten on its back and tickled its belly with the end of a saddlebag strap. He bent to kiss away the tears, and when she turned further towards him to ease that gentle service, he drifted his lips across hers, at first just brushing then settling to press and caress. He urged her mouth open with his own, and brushed her tongue with his. Her tentative return thrilled through his body and he sank into the kiss, feeling at last at home, after all these years. Sharp pinpricks and an anguished yeowl recalled him to himself, and he eased slightly away from Callie to lift an offended Angel from between them. “Even Christmas Angels should not come between a man and his wife,” he told the kitten, sternly. Callie giggled, a happy bubble of a sound that he had heard many times long ago and missed like a lost limb. He bent to kiss her again, holding the kitten out of the way, this time. “I don’t deserve you, Callie,” he said again. Come sample my wares: four short stories and a novella to entertain and surprise you. The Lost Treasure of Lorne: For nearly 300 years, the Normingtons and the Lorimers have feuded, since a love affair ended in a curse that doomed dead Lorimers to haunt their home, the Castle of Lorne. Now the last Marquis of Lorne, the last of the Lorimers, is one of those ghosts, and the Duke of Kendal, head of the House of Normington, holds the castle. Kendal doesn’t care about the feud or the ghosts. He wants only to find the evidence that will legitimate the son his Lorimer bride bore him before her death, and to convince his stubborn housekeeper to marry him. 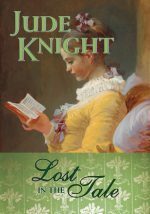 Jude Knight’s writing goal is to transport readers to another time, another place, where they can enjoy adventure and romance, thrill to trials and challenges, uncover secrets and solve mysteries, delight in a happy ending, and return from their virtual holiday refreshed and ready for anything. She writes historical novels, novellas, and short stories, mostly set in the early 19th Century. She writes strong determined heroines, heroes who can appreciate a clever capable woman, villains you’ll love to loathe, and all with a leavening of humour. Looking forward to this collection!